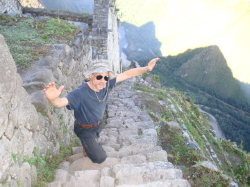 Join me and my guest, Tom Wright, as we explore shamanism (www.a-course-in-shamanism.com). We’ll explore how he gets to the source of a client’s disease and how he can work with the person on the phone or in person to dissipate the blockage. His work allows people to achieve what they want in their life. Tom Wright has a unique background. He’s a former presidential aid and author of the book The Steel Shaman. Tom is a holistic healing professional and is dedicated to enhancing his client’s health. He has been interviewed for his work by Newsweek, AOL America Online and he’s been on the cover of Sedona. He has been invited to speak at The International Amazonian Shamanism Conference three years in a row. Previous post: She Died For Seven Minutes! Next post: ENERGY MEDICINE: What it is, how it works, and how you can use it in your life!